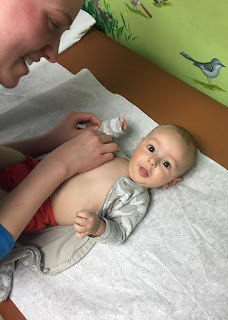 Bless Our Hearts: As The Bard, Jimmy Buffett Said, "If We Weren't All Crazy We Would All Go Insane"
As The Bard, Jimmy Buffett Said, "If We Weren't All Crazy We Would All Go Insane"
What I needed today and needed badly was some baby love. And to get out of the house and to quit weeping and to have someone to talk to and etc. So Lily invited me to come out with her and we went to the library. When the babies are little, I get to sit beside them in the back seat if I don't drive and so today I sat between that angel boy and this angel girl. She got a full tummy before we left and slept for the entire two hours we were gone. And Gibson, sensing, I suppose, that old Mer wasn't at her best, was sweeter than sweet to me. He gave me kisses on my nose, on my forehead, on my chin, on my cheek, each one planted with serious intent. I wanted to take his picture and at first, he said, "No!" but then he said, "Just one." And then he said, "Cheese!" We picked up Owen from school after our Pitaria lunch and so I got to see him, as well. I didn't get to see August today but Jessie sent me this picture when he was at the doctor for his four-month well-baby check. Vergil went with them today so I wasn't needed. That was before he got his shot. So he seems to have recovered. And I am doing better, as well. I am not sure what made me so sad today, so skin-flailed and vulnerable. Nothing. Everything. And I am making pizzas tonight and having a martini and tomorrow morning Jason and Vergil are coming over to work on the roof and all of the grands and their mamas are coming over for pancakes and bacon and so I better bake some sweet potatoes to go into the pancakes and I just heard that my friend's surgery went well, better than expected and I even cried about that a little. I'm just a raw piece of human meat today and that's all there is to it. Which is okay. It's how I am. I, on the other hand, have been uncontrollably giddy today. I've giggled at everything anyone said, talked a mile a minute, and felt so manic that my insides are all bundled up. I've never felt like this before; usually 'just' the normal angst and sadness. To be honest, I prefer the angst because this is all too new and uncomfortable for me. I'm so high strung right now that I feel like if I started to cry I could never stop. Does this make any sense to you? It sure as hell doesn't to me!!! you may be raw today but in a little while you'll be pickled. and I can't believe August is 4 months old already! Auggie Doggy and his Doggy Daddy. Glad you got out. August is clearly Well. Your weekend sound like it's going to be lovely. I'm greedy for photos. I think it's something in the Wind, or the alignment of the planets, or the Spring sap rising, because I'm the same, filled with grief and panic I can't control. I'm just trying not to think about anything at any given moment. This week felt a little like being knee deep in quicksand while people through rotten fruit at me. I see it again in this picture of Gibson. He may be a quieter child but his eyes speak volumes. Still waters run deep. I am so glad your friend's surgery went well! That is something to celebrate. I am glad you had time with your babies. They always help the pain. And their pictures are so sweet. I am really beginning to miss Owen. Enjoy your martini and rest well. Look at Gibson's sweet face! What a fine Saturday morning you have in store. Bless that roof that shelters you all. 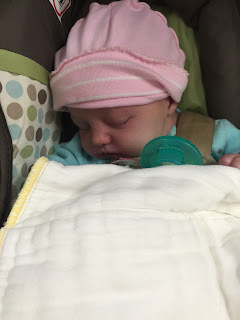 I like this babies-in-hats blog theme! That is a well-baby if ever I saw one. I wept too today. You are not alone. Catrina- Whoa! No idea what's going on. A touch of bi-polar? How are you today? Jo- Good description. Who knows why these things hit us? ain't for city gals- ALL the babies are adorable. That's just the nature of the baby. birdie- They do, don't they? Joanne- I'll get some pictures of Owen today. I promise. Angella- Quite frankly, I am ready for this roof to be done. Not as ready as Mr. Moon and the sons-in-law, I am certain though. A- Mmmm....Babies in hats. Yes. I like it. Elizabeth- If I was that mother, I would just scream all day long. Mwa- Yes. He is quite well. I'm sorry you cried to. Is it ALL the planets? I have those human meat days too. Hope you are good now.